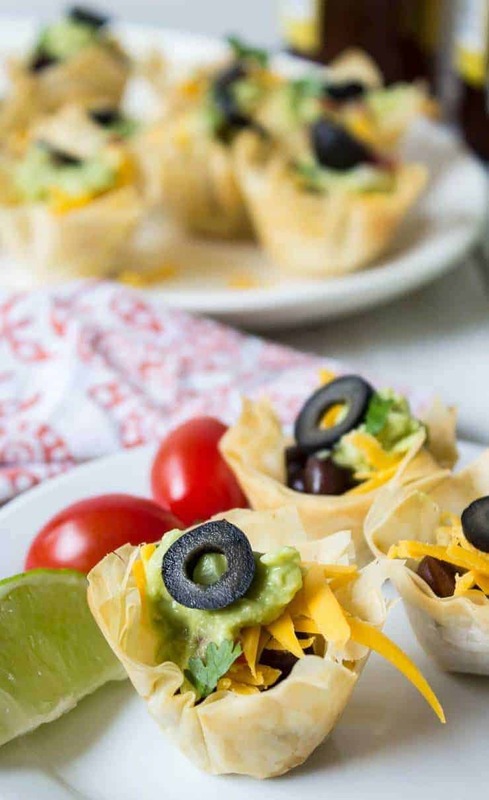 Mini Taco Cups made with black beans and phyllo dough. Appetizers are never out of season. I serve appetizers at just about every get-together we have and there are times when all I want for dinner are appetizers. 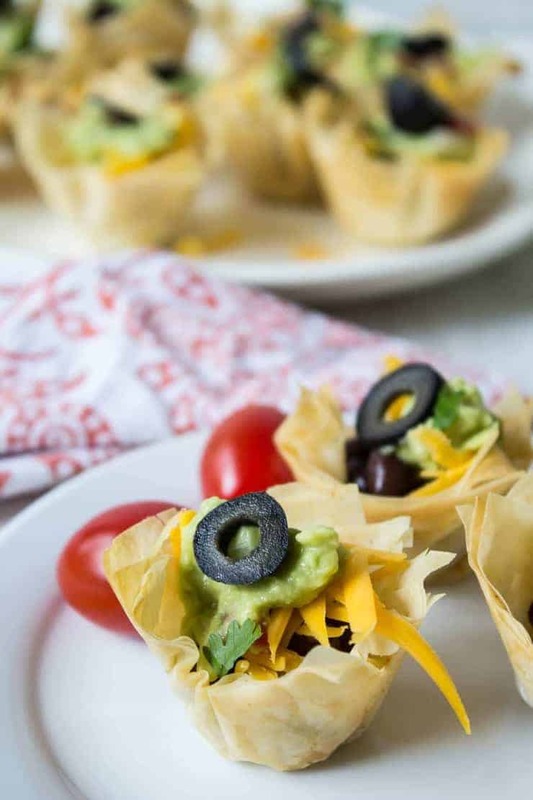 These black bean taco cups are perfect for a party or for just when you are craving appetizers. I used phyllo dough to make these cups. They are super easy, stay extra crispy, and have a great crunch with every bite! Need I say more? I started with phyllo dough and brushed seasoned melted butter between each layer. After four layers, I sliced the dough into 3 inch squares. The squares were placed in mini muffin tins and baked. You can make the cups ahead of time and then fill just before serving. I was a bit worried about the phyllo cups becoming soggy after adding the filling, but they stayed crunchy for a couple of hours! 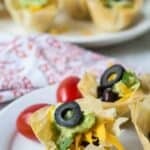 For the filling of these crunchy taco cups, I used homemade guacamole, black beans, tomatoes, cheese and olives. You can easily add your favorite ingredients – like salsa or sour cream. Remove 4 sheets of phyllo dough from package. Cover with a clean towel. Mix melted butter and 1/2 teaspoon taco seasoning together. Place one sheet of phyllo dough on a cutting board. Brush very lightly with butter. Place another sheet of dough directly on top of the first sheet. Brush very lightly with butter. Repeat with a third sheet. Place fourth sheet on top, but do not butter. Using a pizza cutter or a sharp knife, cut dough into 3 inch squares. 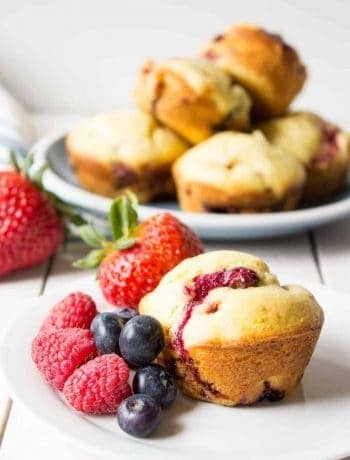 Grab each stack and place into a mini muffin tin pressing dough down into corners. Bake in a preheated oven at 375 degrees for 8-10 minutes until golden. When slightly cooled, carefully remove from muffin tins. Pour beans into a colander and rinse to remove all sauce. Shake to remove any excess water. Pour beans into a bowl and mix in 1/2 teaspoon taco seasoning. Add 1-2 teaspoons of beans to the bottom of each cup. Add a small amount of cheese, tomatoes, guacamole so cups are full. Top with olives and fresh chopped cilantro. Other ingredients to add: chopped onions, salsa, sour cream, slice jalapenos. 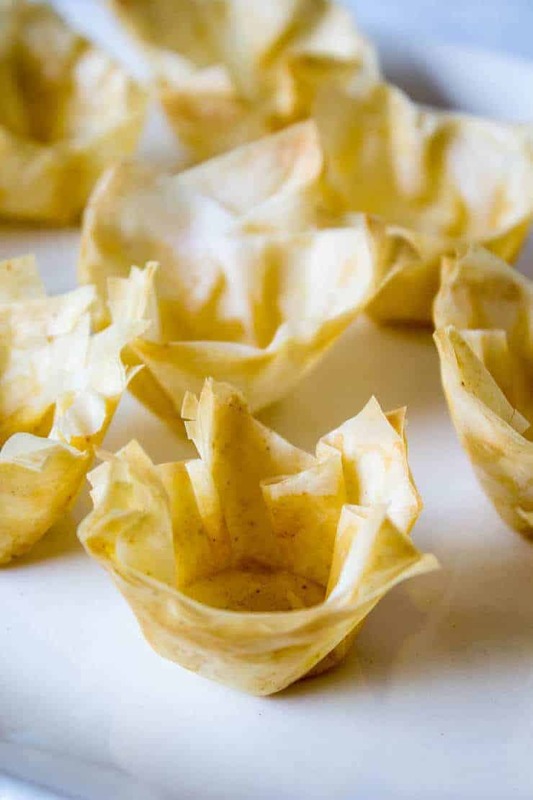 Phyllo cups can be made ahead of time and stored in an air tight container for up to one day. These are so adorable! 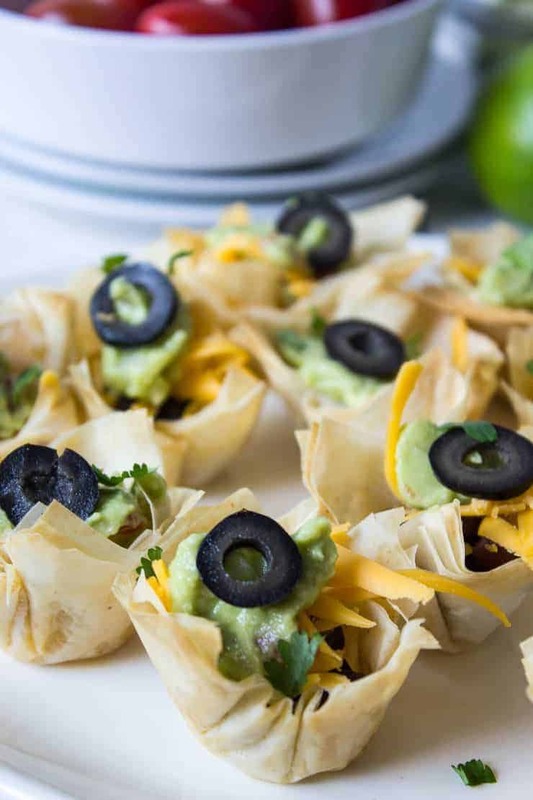 A second ago I didn’t even know about mini taco cups with phyllo dough and now I am totally craving them. 🙂 Beautiful pictures, they certainly made me hungry! Just a little warning…they are addicting! 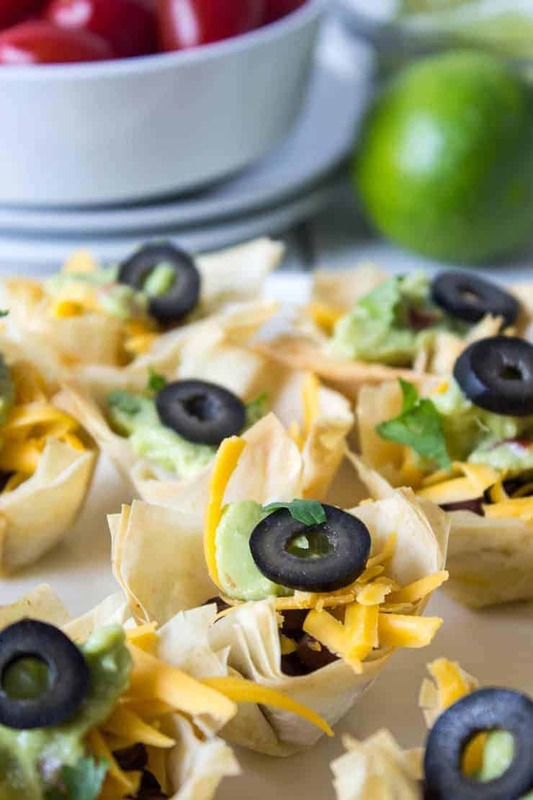 I love all Mexican foods and these cute little appetizer cups look so good! Yummy! Thanks, Elaine! They are really yummy! These adorable taco cups look taco-licious, Kathy. Love the fact you used phyllo dough. Loving these beauties. They are cute! The only problem is they disappear so quickly! Everyone love ’em! This is a great idea. We like to have “Happy Hour” occasionally at our house. We serve “Mocktails”, and have finger foods. I’m adding this to my menu plan. Having a Happy Hour sounds like fun! Say no more and count me in for some of these bite sized tacos! Tacos are one of my favorite foods, but make them in bite sized and I love ’em even more! You are totally right that appetizers never go out of style! No matter what time of the year, there’s always an occasion for delicious appetizers. For me, this is college basketball food now that March is almost here. Love the bite-sized taco approach here. Yum!! You’ll be all set for March Madness with these appetizers! Those cups are so dang cute! Im loving the bite sized goodness! There is something about food in mini form! They just taste better! You had me at taco cups! lol! I LOVE tacos or taco anything and I could eat these cups for dinner…or lunch…or breakfast. Perfect for meatless Monday today too! Hey Kathy, these look great! I love the seasoned butter spread between the phyllo layers, what a great idea. I know these must be extra flavorful!!! The seasoned butter does add a ton of flavor! Tacos in bite sized form?! SIGN ME UP! These look awesome, Kathy! LOVE that you used phyllo dough for the cups! So crispy! 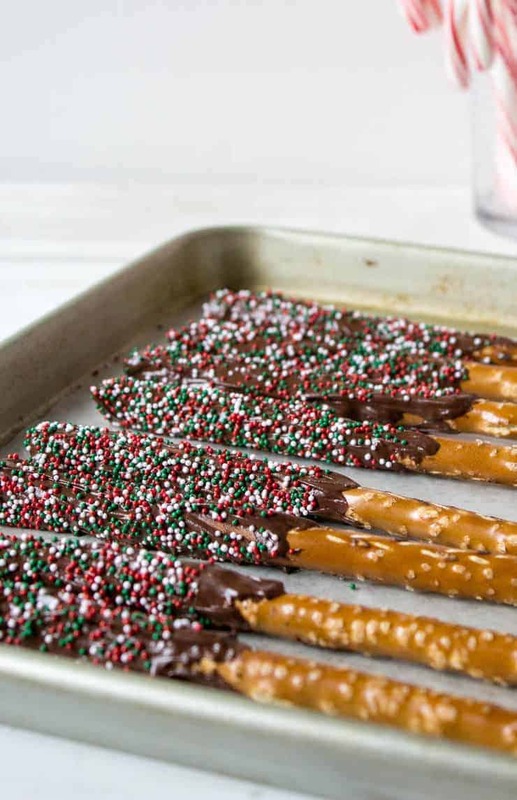 I could totally eat an entire serving tray of these right now! Cheers! Count me in for anything in a phyllo cup Cathy! These look delicious! The phyllo has such a great, light, crunchy texture! We often have appetizers dinners at our house. We love finger foods, like this one. Crunchy, tasty, beautiful! 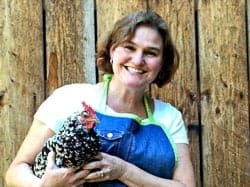 I agree – appetizers are never out of season and like you guys hubby and I often have apps for dinner rather than a big meal. I love little bites of this and that. Get to try more than one thing that way and not feel too full. These cups are so cute! Love that you used phyllo dough. Quick to put together. What a great idea! Thanks, Dawn! I think I need to put these on my dinner menu again soon! I love appetizers for dinner, Kathy and these would be perfect way to end the day. Serve them with some guacamole and chips and I’d be a happy camper. It’s exactly what I love too! Now those taco cups look good. Good enough to eat because now I’m hungry! Great tip about the phyllo dough. I never would have thought about that. 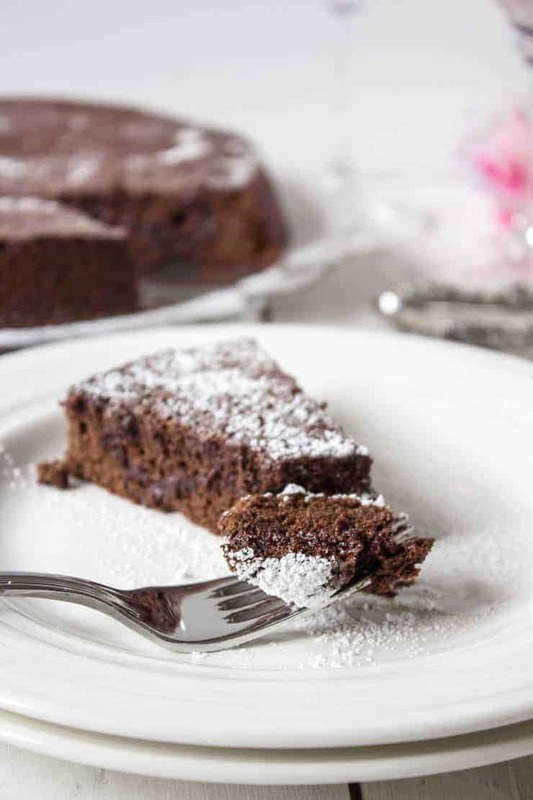 You don’t have to wait for a party to eat these….just make a batch all for yourself and enjoy! It is hard to stop eating these once you get started! Kathy, These look so fun!!! I love little appetizer ideas to make for parties. These are perfect! ? ? ? Thanks, Katie! I always like to have a variety of appetizers and finger foods for parties too!